Children should have their first dental exam no later than the age of three. There are many benefits to bringing your child to a dentist specializing in the treatment of children, and one of them is that our office and team are focused on making sure that each child has a positive dental experience. Providing rides in the dental chair, games about toothbrushing, props such as stuffed animals to help us educate and relate to your child, are all part of providing care for your child. 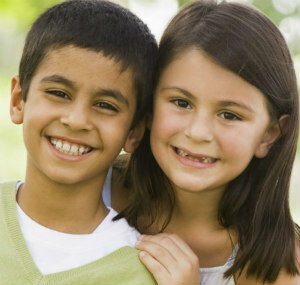 Your child’s dental health is a partnership between the parents, child and the dental team. If we all work together, your child will have the best experience and best results for their care. We want to make sure that your child has the advantages of healthy teeth and gums so that their teeth will support their overall health. Some of the preventative treatments that we provide, aside from regular examination, cleaning and education are fluoride treatments and sealants. Fluoride treatments may be done to provide the strengthening of fluoride to your child’s teeth. Daily eating and drinking can create an acidic environment that can weaken the enamel of the teeth and open a pathway to cavities. Fluoride, along with regular brushing and flossing, does quite a good job at preventing that. Sealants are another tool for preventing dental decay. Sealants are thin, protective coatings applied to the permanent back teeth (molars). They fill in the grooves on the chewing surfaces of the teeth where foods and bacteria can get stuck and cause cavities. Once applied, sealants can last for several years. This is particularly effective against foods like breads, crackers and cereals which tend to stick in the grooves. Although these foods are generally not high in added sugar, when broken down, these carbohydrates convert to sugar that can attack the teeth. Give us a call and schedule an exam for your children. We’ll let you know what the best way is to prevent dental decay.